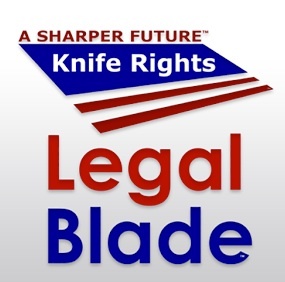 I’ve lamented the fact that there aren’t many useful knife apps out there, aside from the fantastic Steel Knife Composition App from zknives.com, but now you can add another to that list: the LegalBlade app. 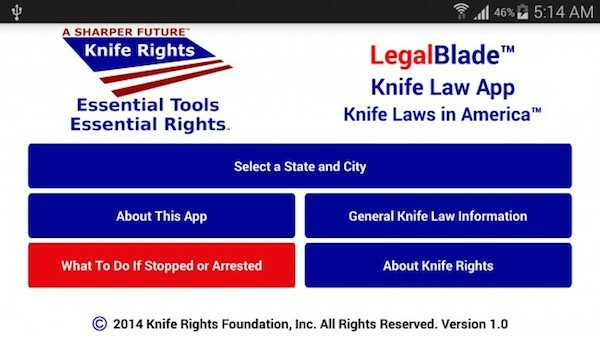 Created by Knife Rights, the app gives you information on knife laws for all 50 states, along with info on select cities and jurisdictions in the U.S.
As someone who travels frequently, I’ve been waiting for something like this to come along. Knife laws in the United States are a confusing mess. Each state has its own variations of certain laws and some cities have different laws than neighboring ones. The app is currently available on Google Play, but it will be in the Apple App Store soon. Since I don’t have an Android phone, I haven’t been able to try it out myself, but when it’s up, I’ll write up a more extensive review. It would be a lot better if the app were free. I am tired of paying for apps when I pay so much a month for service in the first place. Granted it is only 1.99, but that adds up. Everyone has a hand in the little guys pocket.